The greatest trick Aaron McGruder ever pulled was making a show called Black Jesus utterly non-controversial. And that’s a pretty fair critical assessment of Black Jesus. At the end of its first season, it’s basically a low-key, ideologically family-friendly sitcom with a bit more plot and a lot more cursing and weed. This version of Jesus, as played by Gerald “Slink” Johnson, is just a nice dude who wants everyone to be a little nicer to each other, and to themselves (and maybe also give him the last hit on the blunt). If Jesus Christ, Our Lord And Savior returned to Earth and decided to just kick it with his homies and do good work in his community, so what? Though the first episode serves primarily to introduce Jesus and his crew, the rest of the season explores a single, ongoing plot about their attempt to start a community garden in Compton (to help their neighbors and also grow weed). The obstacles to getting the garden up and running are increasingly ridiculous, but they mostly serve to provide a reason for the cast to get slightly worked up—the back half of the season is surprisingly successful in establishing the show’s vibe, but the finale’s attempt to seriously raise the stakes and bring the story to a climax just feels out of place and forced by comparison. 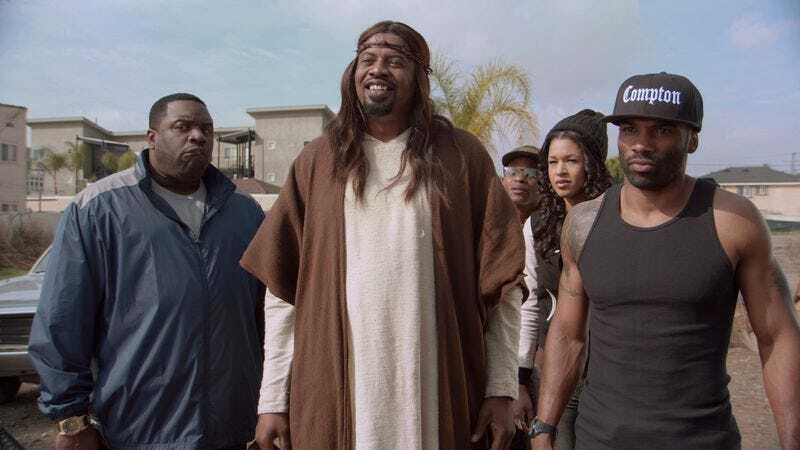 In fact, even with longer-term plots, Black Jesus is so casual that it sometimes feels as if the show is deploying a sitcom reset button at the end of every episode (or at least the episodes sometimes blur together). That makes sense, since classic sitcoms often read as the biggest influence on the series (there’s literally a “let’s put on a show” episode), particularly in Mike Clattenburg’s direction, which somehow injects a goofy, borderline Looney Tunes-like energy into the proceedings while remaining decidedly unhurried. 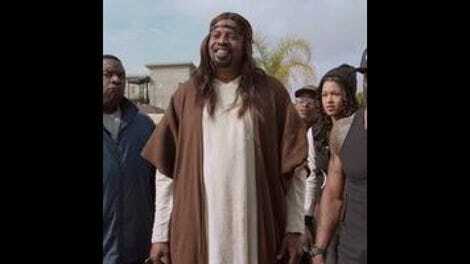 Black Jesus’ reliance on some of those tropes allows the show to simply run a lot of standard Christian iconography through a mashup of Pineapple Express and Good Times. Though Vic questions whether Jesus is who he says he is, the show never really threatens to explore this rather dark possibility, and never suggests that ”Pops” doesn’t have a master plan for everyone. Thankfully, as much as McGruder and Clattenburg buy into the ideas of Jesus, that master plan does not include full-on biblical retelling or Boondocks-style political humor. Far from radical, this is a late-period Common or Talib Kweli album: It’ll make you feel good for a while if you like what it’s selling, but it’s certainly not making any big statements. Besides, nothing ever really feels important enough to get anyone on this show to put their joint down, let alone protest. For the most part, Black Jesus is a pleasant, relatively mindless high, and like an eager-to-please stoner, it’s generally fun to hang out with for 20 minutes at a time. In “A Huey Freeman Christmas,” The Adventures Of Black Jesus play only goes forward because of Mr. Uberwitz, an “irresponsible white person” whose unthinkingly reactive liberal politics lead him to give Huey full creative control before losing his job over the play. That almost a decade later the same concept has produced something so inoffensive, easygoing, and responsible suggests that, just maybe, that irresponsible white person did something right.